In this lesson your children will learn that we can be happy in all situations even when things don't go our way because we can trust God to work out his plan for us. The story of Paul and Silas in jail is used as an example of how we can praise God even when things aren't going our way. This pattern comes in both color and black and white. You can use the colored patterns as posters to decorate your bulletin board. Use Cherry Kool-Aid Mix to make paint. Add a few tablespoons of water to the mix and have your children paint it onto the picture after coloring it with colored pencils. 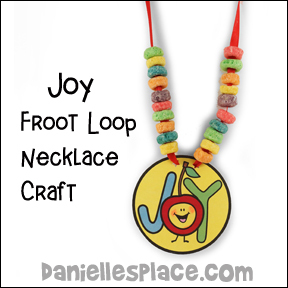 Children color the "Joy" medallion, cut it out, and then string Froot Loop cereal onto a ribbon to make an edible necklace. Children color or paint the picture and then paste Fruit Loop cereal on the picture to decorate it. Children glue red pompoms on to the picture to make cherries. 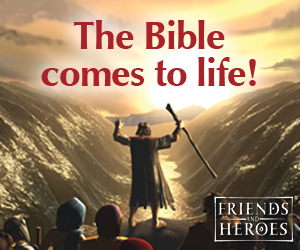 Available in both KJV and NIV. 2. In class write the verse on the board and repeat it several times. 3. 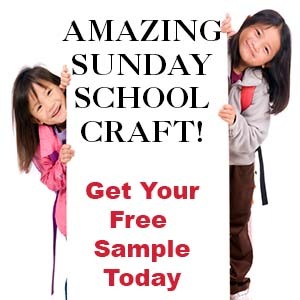 Tell your children that Squirmy wants to help them learn the memory verse. Ask Squirmy if he is ready to show your children the memory verse fruit cards. Have squirmy look around for them and then come up with nothing. Ask Squirmy what the problem is. Squirmy then says that he lost them. Ask the children if they will help Squirmy find them. 4. 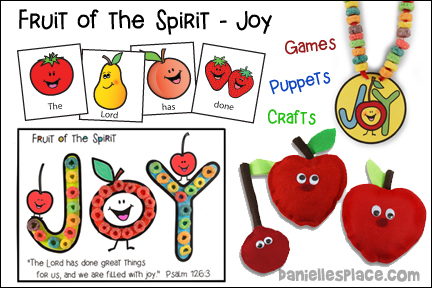 When a child has found a fruit card help him or her put it in the correct order to spell out the verse taping it underneath the words you wrote on the board. 2. Use the patterns to cut the beanbag shapes from felt. 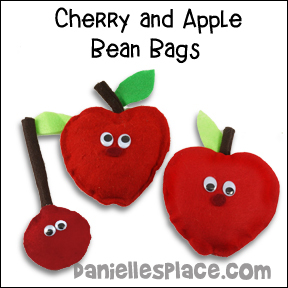 Use dark red felt for the cherries, bright red for the apples, brown for the stems, and green for the leaves. 3. Roll up the stem patterns and use a glue gun to glue them closed along the long edge. 4. Glue the two long stems to two different cherry shapes. And then glue the other two cherry shapes onto the pieces with the stems. Leave about one inch open at the bottom. Fill them with rice and then glue them closed. 5. Glue the two cherry stems together at the top and glue on two leaves as shown. Do the same for the apple, except use the short stem pattern. 1. I can be happy when I have to go to the dentist. 2. I can be happy when I have to clean my room. 3. I can be happy when I loose at a game. 4. I can be happy when I have to go to school. More examples available on The Resource Room. 1. On the rest of the circles draw sad faces. 2. Tape the circles to the floor close together on one side of the room. 3. Have your children stand on the other side of the room behind a piece of tape. 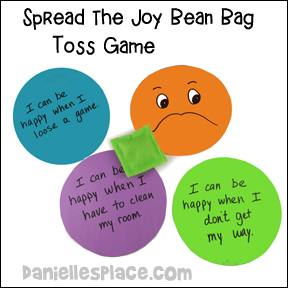 Let them take turns throwing a beanbag and trying to avoid the sad face circles. 4. If the beanbag lands on a circle with words, read the circle and give the child a treat like a cookie and have him sit down. If the beanbag lands on a sad face, the child goes to the back of the line and tries again when it is his turn. Tell that child that God doesn't want us to be sad when we don't get what we want, and that he will get another later. Keep playing until all the children have gotten a treat and are sitting down. 1. Before class cut up an apple and some cherries. Place them in plastic containers, and punch holes in the lids. Make the containers look different so the children can tell them apart. You can wrap red tape around one. Review the two fruit of the Spirit that they have learned so far. 2. In class place the containers at opposite ends of the room and tell the children to smell them through the holes and decide which one they think is the apple and which the cherries. If you have a large class, make several of each type so it doesn't take too long. Tell the children not to tell each other what they think is in the containers. 3. When all the children have had a chance to smell the containers ask the children which container they think the apples are in and tell them to go to that side of the room. When everyone has picked a side of the room, tell them which canister contains the apples and which the cherries.